Distribution and habitat: Tacca integrifolia is a tropical herb with a core distribution in Southeast Asia. In the wild, this plant occurs in the understory of rain forests in deep shade, but in a diversity of soil types. The species is most often found growing in accumulations of decayed organic matter. Description: Tacca integrifolia is long-lived, short stemmed rhizomatous herbaceous plants. It has attractive, entire leaves, vertical growth habit and strange whisker-like (filiform) bracts below the flowers that can hang down for as much as 3m (1 foot) in length. It is these structures and their accompanying cluster of luridly coloured flowers that has given rise to the sobriquet “batflower” for these marvelous tropical plants. Cloaking the flowers from above are two broad, light coloured and showy bracts, expanding like bat wings. Tacca integrifolia has white bracts hovering over the nodding flowers. The bracts are beautifully veined with purple. Beneath the clusters of purplish flowers hang the long filiform bracts, the whiskers. But, occasionally there is a variation and the bracts are purple or pure white and very occasionally the whiskers can be white. The plants reach about 1.2m (4 feet) in height. The cylindrical rhizome of this plant grows vertically and the crown of large, attractive leaves emerge from the top of the rhizome. The leaves are lance-shaped with large blades up to 60cm (24 inch) long sustained on a petiole up to 40cm (15 inch) long. Flowering seems to begin when the plants have produced 2-3 full-size leaves. Each plant produces at least 6 and up to 12 long-lasting flower stems during the warm months of the year. 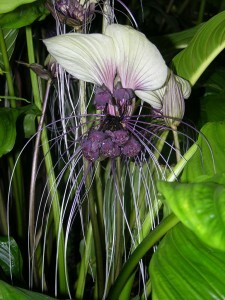 Tacca integrifolia flowers are presumed to be pollinated by flies. In cultivation, apparent self-pollination takes place in a certain percentage of plants. The leathery capsules about 4cm (1.5 inch) long require up to a year to ripen. When they split along their sides, numerous 0.5cm (0.25 inch) seeds are revealed embedded in a sticky pulp. Houseplant care: Tacca integrifolia plants can be successfully grown indoors. In terms of growing conditions, Tacca integrifolia should do well in the same conditions that nurture orchids and many epiphytic ferns with ample humidity, strong airflow and moderate light and temperatures. This is definitely one of those plants where should not confuse watering with humidity… give it humidity, heat, then water. Light: Indoors, Tacca integrifolia plants will thrive in bright light, but should not be exposed to direct sunlight. Temperature: When growing Tacca integrifolia, keeping the environment temperature in the range of 21 to 32°C (70-90°F) with plenty of good air circulation, creates a more conducive setting for this ultra-tropical plant. Humidity: Because these plants naturally grow in the warm rain forests of the tropics, they experience steamy conditions nearly year round. Humidity levels above 50% are best. Such high humidity is uncommon in homes, but humidity can be elevated with humidifiers or by placing the plant’s container atop a pebble-filled tray of water so evaporation around the plant is locally elevated. Avoid drafts from heating or air conditioning vents as this will cause the edges of the leaves to brown. Watering: During the growing season (late spring to late summer) the plants will need frequent watering to keep the potting mixture evenly moist. During the rest period, keep the potting mixture just barely moist until the plant resumes growth in spring. Use tepid water when water these plants. The tepid or mildly warm water certainly should be no more than 5 degrees Celsius (10 degrees Fahrenheit) colder than the air temperature the plant experiences. If possible, captured rainwater or purified water is better to use on Tacca integrifolia plants than tap or soft water. Tap water contains chlorine and fluoride that leads to brown leaf edges, and the higher concentrations of salts in softened water cause the same foliage defects. Feeding: Fertilise biweekly during the growing season with a diluted liquid fertiliser or orchid fertiliser. They are heavy feeders and also appreciate the use of controlled-release fertiliser. Potting and repotting: Tacca integrifolia dislike being pot-bound and appreciate a wider, shallow pot. Repot them in spring before the new flush of growth emerges. Never change the pot of a plant in flower. Typically this plant can be grown in a 15cm (6 inch), 20cm (8 inch) or 25cm (10 inch) pot. Use a potting mixture that is light, very porous and drains well, such a mixture can be made by combining 60% peat moss, 30% perlite and 10% vermiculite. Also, a potting soil mix designed for orchids will be suitable for these plants. Add controlled-release fertilizer pellets to the potting mixture. Older, larger rhizomes can be trimmed of leaves and roots during repotting and put back into the original pots, using fresh potting mixture. Remove and pot separately all the offsets and if the plant is well established, take a division to start a new plant. Gardening: Only grow Tacca integrifolia in the ground in the garden in the tropics or in a proven spot where the plant has been grown out in a pot. Otherwise keep it in the pot. This will make it easy to move it in winter when the plant will need shelter. Never pot up these plants unless there are still 2-3 months of warm weather. Location: This plant should be planted in partial shade and in a humid and warm environment with plenty of good air circulation. Outdoors in tropical areas, humidity is often sufficiently high during the warmth of spring to fall, but in the drier winter months, the leaves show browned edges from low humidity. Soil: Tacca integrifolia plants need rich, well-draining soil enriched with compost or leaf litter. Like most rainforest tropicals, in nature they grow in a thin layer of detritus and humus so the roots do not have a chance to rot. Use a soil that, while wet, allows for a lot of oxygen. Irrigation: Plants need adequate water during the growing season, but should be allowed to dry out during the colder months. Fertilise: They do not like strong fertilisers. Fish based fertilisers are great for promoting flowers. Tacca integrifolia tolerates most commercial plant fertilizers and organic composts. Do not fertilise them during the rest period. Spread 8 to 10cm (3- 4 inch) of shredded pine-bark mulch around the plant to help with moisture retention and reduce weed growth. Propagation: Tacca integrifolia can be propagated from seed and stem budding. The seeds should be cleaned of the pulp, air-dried and planted immediately. Seed set can be increased by artificial self- or cross-pollination. Sow seeds trays in any standard germination medium (equal parts of peat and perlite or equal parts of vermiculite and perlite) and cover them 0.3cm (0.125 inch). Keep the propagating trays in warm, moist conditions (intermittent mist ideal) in bright light, but no direct sun. Germination takes 8-12 weeks. Prick the seedlings out into individual cells or small pots 6-8cm (2.5-3inch) pots when the first leaf is well-developed. The seedlings benefit from frequent dilute applications of soluble fertilizer. When small, they pass through a stage of almost chronic chlorosis, even with regular fertilization, but overcome this in a few weeks. Move them into 15cm (6 inch) pots once they are well-established in their cells or small pots and the plants are about 5cm (2 inch) tall at that time. The plants thrive in 70-80% shade. Thereafter treat them as mature Tacca integrifolia. Tacca integrifolia are increased by offsets which are produced sparingly from the sides of the thickish root – stock. This kind of propagation is a good idea to be done during repotting. The offsets should be placed singly in 10 or 13cm (4-5 inch) pots. These should be well drained with plenty of crocks at the bottom, and a compost of fibrous loam, peat and coarse sand in about equal proportions should be used. The offsets should be placed in a heated propagating frame and should be maintained a temperature of 21°C (70°F). The atmosphere should be kept fairly moist, but not too much so, as the offsets are liable to rot away. In a few weeks they will be well rooted and may then be exposed to more light and air. As the new plants increase in size, they may be potted on each year into slightly larger pots than before. Problems: Tacca integrifolia is remarkably free of pest and disease problems. Snails and slugs are the only pest problems. Treatment: Use a bait See Snail and Slug bait to control them. The salts in fertilisers can lead to plant stress and root burn, which can cause plant dehydration and leaf edges to brown. Treatment: Flush the potting medium very thoroughly, to wash away the salt built on roots. When using fertiliser, follow product directions carefully. In general, any stress on a Tacca integrifolia plant can lead to leaves developing brown to yellow leaf edges. Browning of the glossy green, often pleated leaves on these plants results from inadequate humidity, disease, temperature changes and water impurities. Even with the correct soil and watering, Tacca integrifolia can develop leaves with brown edges if ambient humidity is too low. Misting a Tacca which is in a dry-air environment is a quick killing technique. What happens is the pores from the leaf surfaces are opened up while the mist quickly dries up. As the plants pores are opened, the leaves lose more moisture through their pores in the dry environment. After this process is repeated a few times, the leaves develop large yellow splotches and holes begin to form in the leaves, then the leaf edges turn brown and crisp. The leafless plant can no longer supply the roots with food for the rest of the winter months. At this stage the plant will go dormant and if the soil is wet, the plant become prone to rot fungus which will kill the plant. Treatment of wilted Tacca integrifolia: Take the plant in bathroom, turn on the hot shower and let the room steam up. Close the door and leave the light on overnight. This will perk up a Tacca integrifolia quicker than anything else. They love the moisture and heat. Furthermore, use a humidifier, a tray with moist pebbles or choose grouping the plants to rise the humidity. Notes: Tacca integrifolia (the Giant Bat Plant) is much bigger and much, much more spectacular than Tacca chantrieri (the Black Bat Plant)…. and is easier to grow. Tacca integrifolia plants are stemless, herbaceous perennials that are semi-evergreen. Native to the monsoonal rain forests of southeastern Asia, they produce the most leaves and flowers in the warmth, humidity and ample rains from spring to fall. As temperatures and humidity naturally drop in the tropical winter or dry season, leaves naturally abort. They begin by displaying dried leaf edges and yellowing before collapsing. The plant rests semi-dormant with the underground rhizome alive, but not spurring new growth until moister, warmer conditions return in spring. Tacca integrifolia do not seem to need a resting period if proper conditions are provided in terms of temperature, water and humidity. Uses and display: Tacca integrifolia offers a long-lasting showy display as houseplant and in outdoor settings. As exotic as the flowers are, they perform poorly as cut-flowers and wilt soon after cutting, even if floral preservative is placed in the water.